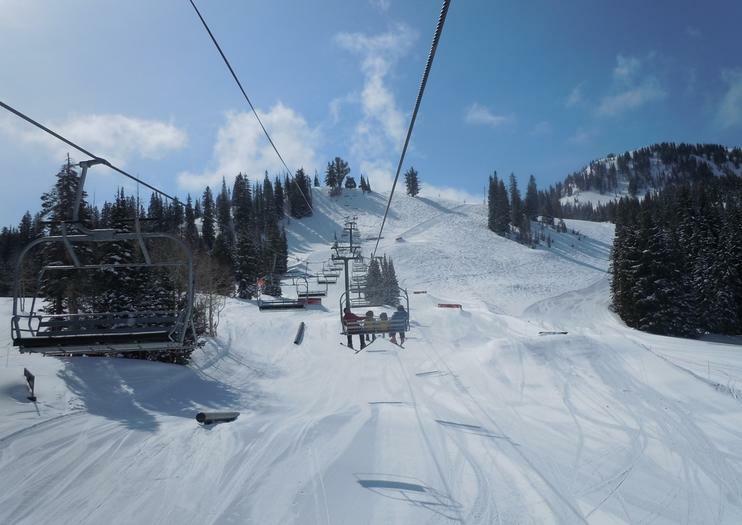 With one of the largest annual snowfalls in Utah, Brighton Ski Resort is a favorite with skiers and snowboarders who appreciate the affordability, high-quality snow, and unflashy atmosphere. Located in Big Cottonwood Canyon in the Uinta-Wasatch-Cache National Forest, the resort offers free skiing for children under 10, making it particularly popular with families. On the smaller side of Utah’s ski resorts, Brighton features 1,050 skiable acres with five high-speed quads that reach all 66 runs, so families can ride up the lift together, ski the runs that suit their levels, and then meet back up at the bottom of the lift. A cafeteria, bar and grill, chalet, and coffee shop offer food and beverages. Season passes, day tickets, and a combo ticket for both Brighton and neighboring Solitude Mountain Resort are available. The retail shop sells hats, goggles, sunglasses, gloves, sunscreen, lip balm, and other useful (and often forgotten) items. Locker can be rented to store your belongings at the bottom of the mountain. Free trail maps can be picked up at ticket booths. Equipment can be rented and repaired on-site and stored overnight at the rental shop. The terrain is 21 percent beginner, 40 percent intermediate, and 39 percent advanced. Head southeast of Salt Lake City to Utah State Route 190; the resort is situated about 30 miles (50 kilometers) from the city. Ski season typically lasts from mid-November to mid-April, including night skiing, which is available during most of that time. Visitors may want to avoid holidays and 3-day weekends to enjoy the resort without large crowds and long lift lines. Unlike many bigger ski resorts these days, Brighton does not operate its lifts during the summer, but it does operate its store and Milly Chalet for visitors to enjoy dining and drinks on the mountain. Summer activities include hiking the trails and a playing disc golf on a 9-hole course.